Folk Music for Children by Elizabeth Mitchell - Oh So Girly! Whilst listening to music on Spotify I came across the music of Elizabeth Mitchell and ever since then I’ve had her songs in my head! I think these happy songs can be great for kids as well as for adults who enjoy reconnecting with the part of them that used to like kids songs when they were younger! 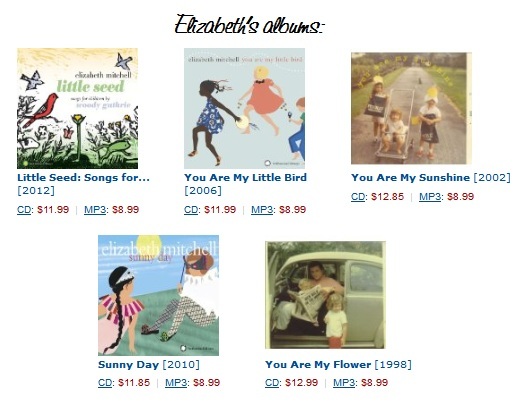 You can find out more about Elizabeth and about where she is currently performing at youaremyflower.org and you can buy her songs on Amazon either individually or as a set in one of her albums.